America is almost three years into fighting World War II, with invading Allied forces pushing across France toward Germany. On September 12, the front page of the Rocky Mount Evening Telegram proclaims, “2 U.S. COLUMNS RAM SIEGFRIED LINE” — and, in smaller type, “Hurricane Drifts Toward U.S.” Forecasters at the U.S. 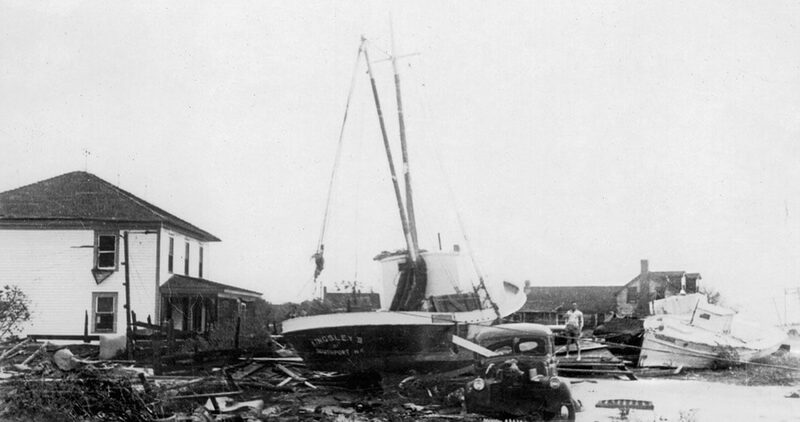 Weather Bureau Office in Miami, who are tracking what will be one of the worst storms to hit the Outer Banks in the 20th century, name it, simply, The Great Atlantic Hurricane. The heavy deployment of men and vessels along North Carolina’s coast leaves the area especially vulnerable. About 400 miles southeast of Cape Lookout, the destroyer USS Warrington and a companion ship, the USS Hyades, steam into the maelstrom, crossing right into the eye of the hurricane. Unable to proceed against the monstrous waves, the Warrington heaves to while the Hyades sails on. By the early hours of September 13, the storm has intensified, and the destroyer takes water down its main vents. “The water rushing into her vents caused a loss of electrical power which set off a chain reaction,” explains Ken Adams, the radioman aboard USS Edsall who received the Warrington’s distress call. Shortly after noon, 70-foot seas roll the Warrington onto its side, and the destroyer slips stern-first under the sea. Ten vessels comb the ocean for survivors, rescuing just 73 of 321 officers and crew. The Marine Corps Air Station at Cherry Point is placed on emergency alert. Army and Navy airplanes are ferried inland. Farther south, soldiers at Camp Davis are moved away from Onslow County beaches. The hurricane slams into the northeastern coast of North Carolina on September 14 and devastates the region from Core Banks to Currituck. Portsmouth Island is temporarily drowned by the surging waters and a tide reported at 14 feet. By 7 a.m., the wind is blowing 86 miles per hour. Before long, it’s more than 100. The streets of Ocracoke turn into rivers. Big Ike O’Neal, an Ocracoker, opens the front and back doors of his house to let the water rush through and keep the structure from washing away. Numerous houses on Ocracoke are damaged, and six are completely destroyed; damage is estimated at half a million dollars. The village water tank is knocked down and the islanders are without drinking water. Fifteen evacuees make it to New Bern two days after the storm. Many report that their families have lost everything but the clothes they are wearing. The storm moves up the coast, striking Hatteras Island. 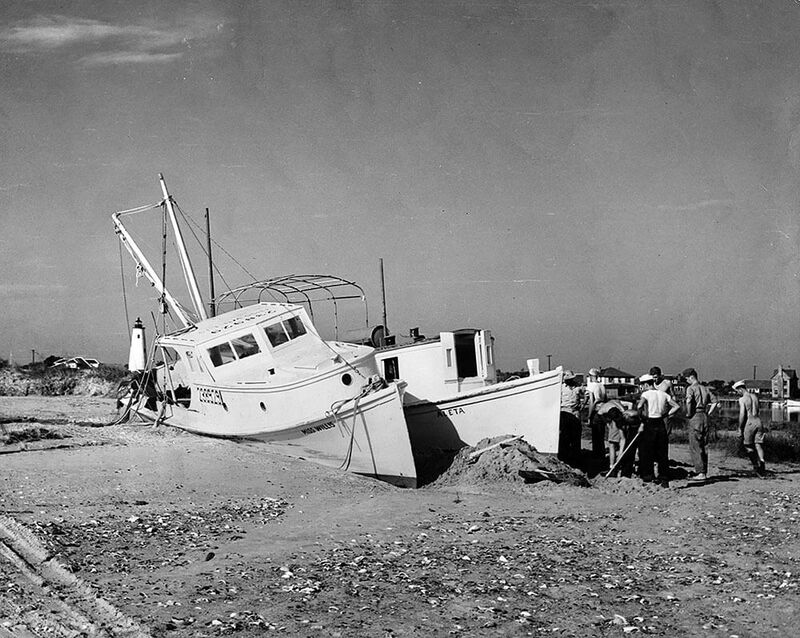 Fishing boats are slammed onto the shoals, damaged or sunk. Gray’s timing is bad — he’s trapped inside the store as the back side of the storm spins in, and the building floats away with him inside. He manages to escape into a tree, where he hangs on for three hours. Avon has become a floating village — houses and sheds rocking past on the waves. Luckily for Gray, his house — with his family still inside — drifts less than a mile before it grounds on sand. Others are carried into the surf. Indeed, moving the surge-scattered houses back to their original sites will prove one of the most vexing tasks that the islanders face. In Avon, only 12 homes are left standing; in Rodanthe, just two remain. Some 300 families seek relief from the Red Cross. Near Salvo, the Gull Shoal Coast Guard Station is swept off its foundation and carried along the beach for a quarter of a mile before fetching up in the pounding breakers. “Africa was a picnic compared to this,” says Capt. Willie Wescott, who had just returned from fighting Rommel’s troops. “I was just plain scared.” The demolished station goes permanently out of service. On Bodie Island, “L.S. Parkerson, hotel proprietor at Nags Head, was shocked unconscious Thursday by a live wire falling on his car,” reports the Statesville Record and Landmark. “He died later.” He is the lone civilian fatality in North Carolina. Waves breaking 100 feet high sink two Coast Guard cutters — the Bedloe and the Jackson. Both are sunk off Oregon Inlet while escorting the torpedoed Liberty Ship George Ade in sight of the Bodie Island Light. The Liberty Ship somehow makes it safely into port. Of the Jackson, the Coast Guard details an equally grim fate: 25 men, including the 23-year-old skipper, Lt. Norman D. Call, go down with the ship. The wind is blowing so hard, the sand it picks up scours the paint off automobiles and blows most of the water out of the Pasquotank River. According to the Elizabeth City Daily Advance, “Not in its entire history has Roanoke been utterly isolated from the outer world.” In Manteo, floodwaters crest five feet above ground-floor level. At Fort Raleigh, home of The Lost Colony theater, the tops of centuries-old pine trees are twisted off, leaving a swath of jagged, 20-foot-high stumps. 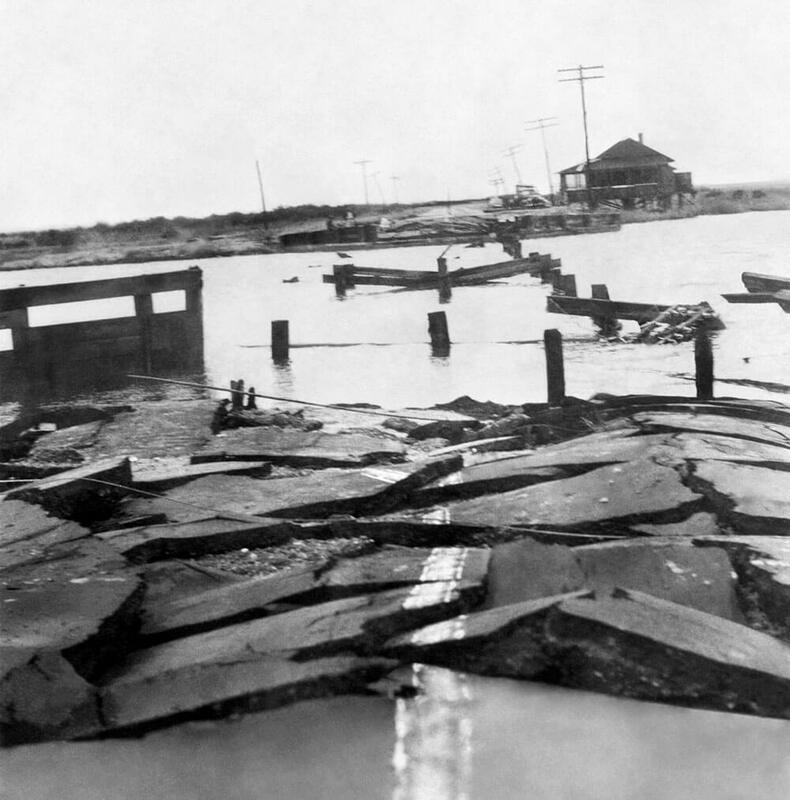 Wanchese, at the southern end of the island, fares even worse, bearing the brunt of a 10-foot tidal surge that wipes out 3,000 feet of causeway, along with a bridge linking it to Nags Head. North along Route 158, the bridge at Coinjock has been seriously damaged by a barge torn adrift from its tow, closing the highway. When reports reach Gov. 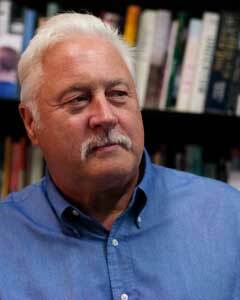 Joseph Melville Broughton that private operators are charging the outrageous sum of $5 each way to ferry cars across the narrow Intracoastal Waterway, he decrees that until the span is restored, the state will provide free ferry service. With the water supply contaminated by the over-washing salt water, islanders have no source of potable water. The American Red Cross provides two distillation plants that can produce a combined 20,000 gallons of fresh water. The Great Atlantic Hurricane whirls north, inflicting damage as far as the Canadian Maritimes. By the time it dissipates in the cold Labrador waters of the North Atlantic, the storm has claimed nearly 400 lives — 344 of them military personnel, including those who perished on the Warrington, Bedloe, and Jackson. The storm leaves a wake of wreckage almost 1,000 miles long — the shattered aftermath of great natural violence. On the North Carolina coast alone, 108 buildings are destroyed and 675 others are seriously damaged, and property and crop losses total $1.45 million. Despite the widespread devastation up and down the coast, little is known to those living inland. The Red Cross report compiled by officials who overfly the trail of flattened villages is classified for “reasons of security.” Due to wartime paranoia, reports about the strength of the storm and the destruction it causes are censored, lest U-boat captains lurking offshore pick up the news and move in to take advantage of the chaos onshore. Special thanks to Mary Ellen Riddle, Education Curator, Graveyard of the Atlantic Museum. Thanks also to Samantha Crisp, Director, Outer Banks History Center. September 1944: My Remembrances”: May 2008. Carney, Charles B., and Hardy, Albert V. North Carolina Hurricanes: A Listing and Description of Tropical Cyclones Which have Affected the State. U.S. Department of Commerce, Environmental Science Services Division, Weather Bureau: revised August 1967. Hairr, John. Great Hurricanes of North Carolina. The History Press: 2008. Keller, Neel. “’Cape Hatteras Boy’ looks back on the Banks in the 1940s.” Outer Banks Sentinal, Dec. 14, 2011 (reference Life magazine story of 1947). Silverstein, Judy (PA2, UÍCGR). “Adrift: Coast Guard Cutter Jackson.” United States Coast Guard: 2006. Cherry Hill, NJ, Courier Post, Sept. 11, 2017. United States Coast Guard. Press release: Norfolk, VA, Sept. 18, 1944. Reprinted in https://www.ibiblio.org/hyperwar/USN/ships/tande/WSC/wsc142-pr.html.